This one sounded like a good idea, but I messed up on the stamping a little. It looks okay from a distance though! 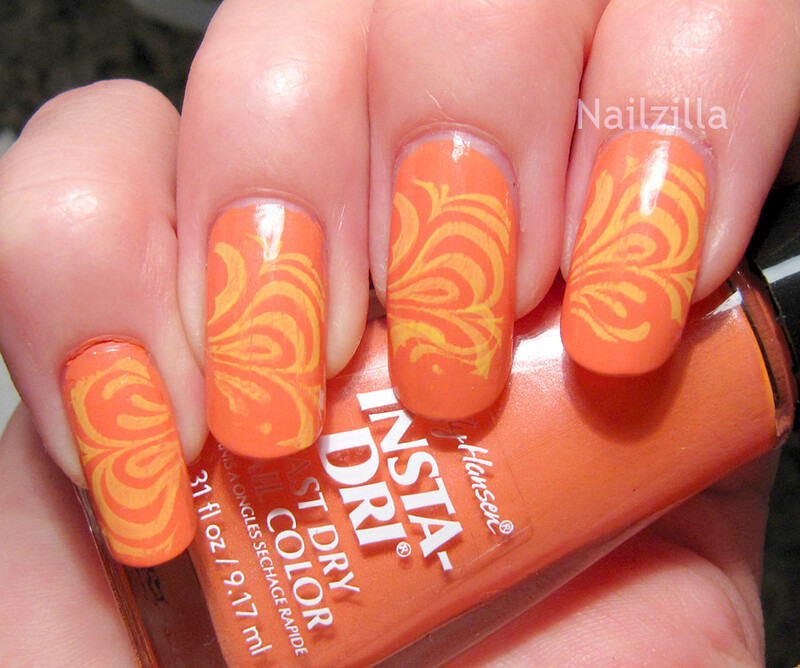 The polishes I used were Sally Hansen Instadri Snappy Sorbet and Lightning stamped over it. Very opaque cremes, I keep acquiring these strictly for the stamping most of the time because let's face it - Konad special polishes cost a lot and some are not opaque at all (I'm looking at YOU, special gold). I did like the color of Snappy Sorbet though, it's an incredible mango-peach and the name really fits because it's really neither. It's just orange enough to be bright and a little pink to separate it from oranges in my book. The pinkiness keeps it looking surprisingly nice on my skin tone and this is a big plus that China Glaze - Peachy Keen does not have. I think layering some shimmer effects polishes over this polish might be a good idea. What are your thoughts on peachy polish? Did you find one that works with your skin tone? I think it looks really cute. I like the two colors together. i think you did a great job on stamping! this mani looks beaaautiful :D i've recently purchased more plates so i can get better at stamping. i tried it a couple of times over the weekend, but it's not good enough to blog about yet lol :x i've found several peaches i like, and they're all pink or yellow toned. i think the orange toned ones look wack on me! Thank you! Ooh, which plates did you get? And yeah, pinky peaches are awesome <3 I love those! Instadri is good for stamping? Why did I not know this lol!! I'm kinda disappointed in some of the konad lacquers! !